In his latest book ‘The Liberty Amendments: Restoring the Republic’ Mark introduces his offerings, based on his constitutional and legal background, as to what steps are necessary to restoring what the Framers intended through state-proposed Constitutional Amendments by way of option 2 in Article 5 of the Constitution. 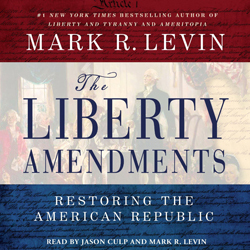 Levin’s hope, and the hope of millions of other Constitutional Conservatives, and Libertarians alike, are that this book will be the first step in beginning the dialog. This is the new grassroots effort to restore the Constitution. Mark’s new book ‘The Liberty Amendments‘ became the national best seller on Amazon before it was even released, and will soon become yet another New York Times Best Seller, explains, in detail Mark’s legal and constitutional rationale (as the framers intended) behind his beginning amendment proposals. Watch the videos below as a great introduction to what he he written in his new book. Through his syndicated radio show, with an audience of tens of millions, in concert with several other hosts and leading Conservative figures, along with the Tea Party; Mark is essentially starting a new ground movement, what he refers to as ‘The Liberty Project’ to restore the Constitution to its original state and return power to the People instead of continuing to allow Lobbyists, Statists, Corporatists, and “professional politicians” to decide the fate of the People. It was not intended for Government, or those in positions of power to decided our fate. Our fate is for the People to decide through true state representation as Constitutional Republic and not through Majoritism (Mob Democracy). The aforementioned Oligarchy of crony power-brokers are legislatively and conveniently removed from the laws they dictate onto the People. It’s time to reset The Constitution and put power back into the hands of those whom it effects the most! Click here or on the image above to purchase your copy of ‘The Liberty Amendments’, get involved in your local 912 groups and Tea Party and begin the hard work of promoting these starting amendments in your state to your state leadership. DO NOT just make this an interesting read, make it a CALL TO ACTION. We as Constitutionalists need to be as dedicated and physically involved as those that appose us on the Left, who have been steamrolling the Establishment Republicans for the last couple of decades. It’s time for us to put some hard work into protecting our children’s freedoms and liberties. Is it convenient? Of course not, but our fight our liberties and freedom must NEVER cease! Watch the videos linked in order below and let them motivate your feet into acting locally in this movement toward restoring our liberties!! These are in order of appearance. I wish FOX allowed embedded video in Word Press, but pop-up links will have to do at the moment. Should we impose congressional term limits? Is a life tenure too long for Supreme Court justices? Make following GOD and The Liberty Project your new Religion!! It’s time for a positive Constitutional RESET! This is our PEACEFUL – REVOLUTION!! Make your time with family, church, and action groups your recreational activity. Turn OFF MSM and stop feeding wealth to the machine that is destroying our nation. I believe in term limits; however, there needs to an exception! Ever since the 1880’s the Progressive Movement in America has been Building. Teddy Roosevelt, President Wilson, and most especially FDR with his, New Deal and New Society solidified the Big Government Ideologies of the Progressive Movement. To fully remove those Ideologies we as a nation need to elect a truly died in the wool Conservative President and allow thru the national midterm election referendum of the second term the opportunity of a sitting President to be elected to a third term and same for the fourth term. This should only be allowed for this one proven Conservative. Just think if President Reagan would have been a four term president? just think if a sane Electorate had elect Perot for four terms? We then need to elect a two term died in the wool Conservative. NOTE: allowing ” ‘ FRAUD prez bam ‘ ” and any of “it’s ” ” things ” this opportunity would be Disastrous!!!!!!!!!!!! This is why Voter integrity through Photo Voter Identification is of utmost priority prior to the next election and why we need to throw ” thing, ” Eric Holder, under a whole line of 1000 Buses!!!!!!!!!!!!!!! Term limits for Judges I don’t know about! The reason for no term limits for them is that change should be brought about slowly, which is why the Founding Fathers did not set terms for them. If Voter Photo ID’s strengthen the election process this will put things(no quotations) back in order above all else! Educating the “LOW INFOMATION VOTER” is something else that needs to happen also! Most of them don’t even vote anyway! This may be Unconstitutional; however, maybe every American eligible citizen should be required to vote and to pass a test proving he/she is knowledgeable and only knowledgeable about the issues. This is assuming no voter fraud; however thousand of years of Human Nature say this will become fraudulent! I welcome your thought on this Mr. Levine. I see what you’re talking about Will, but as an avid listener and fan of Mark Levin myself, I can assure you that he is not one to speculate beyond the original intent of the founders. He wrote these 11 Amendments essentially as a ‘starting point’ in order to kick off the process with his knowledgeable recommendations to “restore” but not really to over-embellish the Constitution with agenda oriented ‘political’ qualifications. I understand your point and actually agree myself, but when the states eventually initiate the required State Conventions to Amend the Constitution, these and other amendments will be considered. I’m sure a lot of suggestions and recommendations will come out of that process. The key to this process is that 3/4 of the states must ratify and agree to the same set of new amendments and essentially the same wording or else it will not be a successful and united effort, which is important. We need the new set of State-Ratified Amendments to be accepted with NO complications or any excuses from the Progressives in the Federal leviathan to not process the requested changes. As we all know, they will do everything in their power to intercept and /or nullify this effort. It has to be done by the letter according to the rule as stated in Article 5 of The Constitution and then some. The other thing we have to take into account is that It won’t only be stanch Conservatives involved in the state-level Amendment process. There will be moderates and Libertarians throwing in their thoughts as well, and as much as some Stanch Conservatives may wince at the thought of that, we must all remember that they are citizens who have a right to be involved in the process as well. But the good thing is that the Amendments being addressed are pretty universal and should appeal to Constitutionally-minded Americans, even Liberals who claim to be all about The Constitution. Of course the Libertarians and Conservatives are on-board with this process. 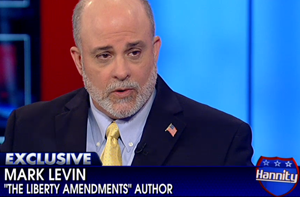 The only one’s who may not like Levin’s suggestions are Statist-oriented goose-steppers and perhaps militant Atheists who desire to rid America of it’s Judeo-Christian values. Thank you for taking the time out to comment Will!